The Dallas Sidekicks are excited to offer instructional camps this summer to further ignite a passion for soccer in DFW and advance both the indoor and outdoor games. Camp curriculum is designed for ages 5-12 and is centered around the fundamentals of passing, controlling, dribbling, shooting, heading and defending. All skills are then emphasized in small scrimmages. Autograph sessions are performed at the end of each day as the Sidekicks players rotate from camp to camp. Pit your skills against the Sidekicks themselves as you scrimmage against them on the last day of camp! Sidekicks camps are $160 for the five-day session. 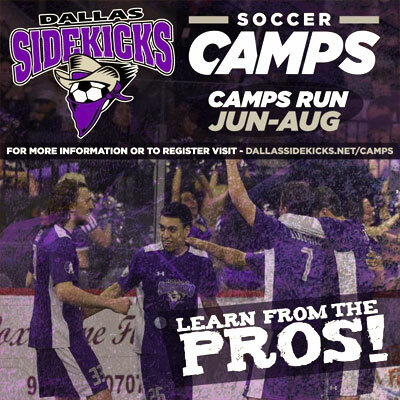 Campers will receive a t-shirt, soccer ball, and autographs from Sidekicks players. 1) Share our Summer Camp Guide on your Facebook page (link follows). Just copy and paste the link on your Facebook page and make sure that it’s set as publicly viewable so we can see it. 2) Then in the comments below, paste the url of the shared post on your Facebook page or the url of your Facebook page so we see that you have shared it. *Note that unless your post is shared as a public post, we can’t see it. One entry per person; one winner; prize is a full week of Sidekicks soccer camp; you choose week when you sign up.